There is a rich biblical tradition of praying for governmental leaders. We see it in both the Old and New Testaments. In my book The Politics of Praise, readers pray through Psalms 72 and 146. Psalm 72 is a prayer for the king at what seems to be his coronation. It gives us a picture of what kind of leadership God blesses. Along with devotional readings on the two psalms, I also wrote a few essays designed to help people enter the world of these amazing prayer poems. I offer you the essay on Psalm 72. I invite you to read the essay, and more importantly, prayerfully read Psalm 72. I hope you will see why and how we are called to pray for all our governmental leaders, which is not something we do, as Trump claims, for the sake of political correctness. Praying for our leaders is in fact a radical act to bring our leaders in line with God’s political agenda of justice and mercy. In the debate a week before the presidential election in 1980, Ronald Reagan posed the now-famous question, “Are you better off now than you were four years ago?”[i] Ever since that debate nearly every challenger to an incumbent leader or an incumbent party has asked this question in one form or another. Republican and Democratic candidates alike ask it every election cycle. Many people use this question as their main lens through which they assess how well an elected official does her job. This question perfectly fits our self-centered culture. In the United States we are consumed with self-realization, self-help, self-actualization, rational self-interest, self-assertion, and being self-made. [ii] We think all institutions—like our government, economy, schools, and even churches—exist to help us discover and make the best versions of ourselves. Reagan’s question is powerful in its simplicity and clarity. It cuts to the core of many of our values and concerns. It is not, however, a Christian question. If we follow the prayer of Psalm 72, we see that we are to assess the quality of a leader’s job by how she uses her power to help marginalized people. Therefore the question we are to ask is not, “Am I better off than I was four years ago?” but, “Is my neighbor, especially my poor and needy neighbor, better off than he was four years ago?” Jesus Christ calls us as his followers to focus not our own interests, but on the interests of others, particularly the interests of the most vulnerable in our society. [iii] This is a countercultural move and the ability to focus on the needs of others before our own does not magically appear in us. We have to pray God would shape us into generous and compassionate people. Psalm 72 is a prayer that does exactly that. The author of Psalm 72 calls us to engage in another countercultural act: praying for our leaders. We have a national pastime of complaining about our government and its officials. We argue about them around dinner tables, at work, and in all forms of media. Political punditry is a giant industry in the United States and those who sling the most mud receive the majority of our attention. These voices demand we support or oppose our leaders, depending on whether those leaders align with the pundit’s positions. We rarely hear calls for us to pray to God for our leaders. Perhaps at the inauguration of a president or at the beginning of a legislative term we might stop and offer a pro forma prayer, but sustained, considered prayer for our government officials is not a discipline that many of us readily practice. To the extent a leader pursues God’s political agenda of helping the marginalized, we pray for Yahweh to bless her. We know a governmental leader who stands for what God values, who uses her authority to end oppression and violence, is refreshing to all people, “like rain that falls on the mown grass” (72.6). If an official does not prioritize the poor and needy, we use Psalm 72 as an indictment against her leadership. We hold up this psalm as an example of what godly political leadership should look like. When a leader prioritizes her own career advancement above the good of the community, vilifies the poor and needy, unfairly privileges the rich and powerful (or even the middle class), feeds our self-centered natures, or worse, engages in oppression and violence, we use Psalm 72 as a guide to pray for her repentance. We should pause for a moment before wading into these psalms. Readers will note the psalmists do not address many of the specific political debates we face today. We receive no instruction on whether we should adopt the liberal vision of a larger government or the conservative vision of a smaller government. The psalmists do not say how much a government should manipulate financial markets. They do not mention whether more power should rest at the local or the federal levels. The silence on these matters means they are open for Christians to debate in good faith and in doing so we have an opportunity to set an example for our society on how to discuss and disagree civilly. But as we debate the shape and size of government, as we consider what laws we should have, as candidates propose their agendas, Psalm 72 gives us a lens through which we evaluate all these matters. The values the psalmist describes should frame the discussion. God calls all of us to make the case that our political positions will best give deliverance to the needy. If a member of Congress believes businesses should run without much government interference, we who pray Psalm 72 will demand he show how free enterprise can better help the marginalized. If a city council member believes corporations need to be more closely regulated, we readers of the Psalms will demand he show how such regulation can better help the dispossessed. If we are shaped by this psalm, we will ask, “Who primarily benefits from this proposed law? Will this law help people suffering under oppression? What size and shape of government best helps poor people?” As we listen to politicians, we will require they show how their agendas will help our most vulnerable neighbors. The Politics of Praise: Devotional Readings on Psalms 72 & 146 is available in paperback and the Kindle format at Amazon.com. [i] Reagan’s expanded on the question: “Are you better off than you were four years ago? Is it easier for you to go and buy things in the stores than it was four years ago? Is there more or less unemployment in the country than there was four years ago? Is America as respected throughout the world as it was? Do you feel that our security is as safe, that we’re as strong as we were four years ago?” “October 28, 1980 Debate Transcript,” accessed December 21, 2014, http://www.debates.org/index.php?page=october-28-1980-debate-transcript. [ii] See Eugene Peterson, Where Your Treasure Is, for a wonderful treatment showing how praying the psalms takes our focus away from the self and places it back on God. [iv] As we pray these psalms we also become aware of the differences between our context and the political contexts when these prayers were written. Psalm 72 in particular raises questions of how we pray for political leaders when the Church is not tied to any particular nation. The following is the first essay from my new devotional, The Politics of Praise: Devotional Readings on Psalms 72 & 146, available both in the Kindle format and paperback at Amazon.com. Some years back I took a tour of the National Mall in Washington, DC. The religious nature of the place struck me. I do not mean Christian, but religious. The giant buildings, the beautiful architecture of the monuments, the larger than life sculptures of national figures all evoke awe and wonder from visitors. When I stood in the Capitol Rotunda at the east end of the Mall, I looked up at the giant fresco Constantino Brumidi painted on the inside of the Capitol’s Dome. In “The Apotheosis of Washington,” George Washington, representing America as a whole, sits in the heavens, surrounded by goddesses and figures of ancient mythology as he becomes a god. At the Vietnam Veterans Memorial people mourn and pray for loved ones who died in that war. The area around the black stone wall is as hushed and solemn as a church sanctuary before a funeral. At the west end of the National Mall the giant statue of Abraham Lincoln sits on his throne gazing out over America like the Greek god Zeus. Consider the epitaph, dripping with sacred terminology, inscribed in the Lincoln Memorial: “In this temple as in the hearts of the people for whom he saved the Union the memory of Abraham Lincoln is enshrined forever.” The National Mall’s architecture and sculpture are as religious as the Vatican’s. The buildings and statues urge us to revere the nation and the government they represent. Being at the National Mall reminded me religion and politics inhabit the same space. Politics will adopt religious language and symbolism and religion has its own political agendas. Many people find the idea of mixing Christian faith with politics troubling. We worry religion will force itself on the state and seek to establish a theocratic dictatorship, or the state will co-opt religion for its own purposes, confusing patriotism for our commitment to God’s kingdom. To be sure, we have historical examples of these negative outcomes happening. Thus we hear voices telling us not to mix faith and politics, to keep faith out of the seats of government, and to keep politics out of the pulpit. The people who warn that “religion and politics don’t mix” certainly know what they are talking about. The mix has resulted in no end of ills—crusades, inquisitions, witch hunts, exploitation. All the same, God says, “Mix them.” But be very careful how you mix them. The only safe way is in prayer. For followers of Jesus, keeping religion and politics separate is a dangerous move that relegates faith to the private sphere where we reduce prayer to mere requests for personal comfort and blessing. We also reduce Jesus to a self-help guru whose only concern is our fulfillment. Despite the serious malfunctions of Christianity’s political involvement, we also see magnificent benefits for the common good when Christians have brought their faith into the public square—the Civil Rights movement in the United States under the very religious leadership of Martin Luther King, Jr. being an obvious example. Readers of the Hebrew and Christian Scriptures cannot escape the deeply political nature of these texts. God does not deal only with the private lives of the people of Israel and the Church. We see God shaping and clashing with people groups, including nations and governments. Neither does God use political terms like justice and peace as if they are empty containers void of any concrete meaning. Rather, God defines these concepts. We read about Yahweh’s expectations for neighbors to peacefully interact with each other. The Bible brims with God imploring people to act justly toward the most vulnerable people in society. The majority of God’s people throughout history have learned to pray using the psalms. If we mediate on them they will teach us how to pray for our civic life, that is, how to safely mix religion and politics. This devotional will guide readers through praying Psalms 72 and 146, two psalms that shaped the political and religious life of the people of Israel. These psalms offer us a vision of God’s political agenda and give us the means to hold our leaders accountable. They do not exhaust all the Book of Psalms or the Bible say about politics, but the pictures of justice and wellbeing found in them are consistent with other political passages in Scripture. Readers will pray through Psalm 146 first. This brief hymn minimizes the importance of government leaders, praises Yahweh for being eternal and powerful, and describes God’s political agenda. Praying Psalm 146 will correctly order our relationships with God and our political leaders. The psalmist reminds us of the transience of government officials and their agendas. If we were to only pray Psalm 146, however, we might think God says governments are unimportant. Therefore readers will then pray through Psalm 72, a prayer for governmental leaders. The psalmist describes the kind of good governance that God blesses. This prayer becomes our measure for how well our leaders do their job. How do we maintain our focus on God when we stand before those majestic statues on the National Mall? How do we keep our commitment to Yahweh first even as other powers, especially our governments, demand our allegiance? How do we pursue God’s agenda in public and hold our leaders accountable to that agenda? I believe the answer to all these questions must start with prayer. In this devotional guide I will not offer a comprehensive vision for how Christians are to engage in public and civic life. I do know, however, that a comprehensive vision of mixing faith and politics will be anemic if it does not begin and remain saturated with prayer. Eugene H. Peterson, Where Your Treasure Is: Psalms that Summon You from Self to Community (Grand Rapids: Eerdmans, 1985) Kindle Edition, locations 103-105. I have published a new daily devotional, The Politics of Praise: Devotional Readings on Psalms 72 & 146. In the book readers pray through Psalms 72 and 146, meditating on one verse at a time. These prayer-poems formed the political life of ancient Israel. If we pray them we will also find God shaping our values and political agendas. The writer of Psalm 146 minimizes the importance of governmental leaders as he recounts Yahweh’s acts of great power and commitment to justice for people on society’s margins. Psalm 72’s author offers a prayer for the king to rule justly, care for the oppressed, and have God’s blessing. Paired together these psalms exhibit a dynamic picture of God’s political agenda. When we face the temptation to confuse our commitment to the kingdom of God with our commitment to our country, the writer of Psalm 146 reminds us hope and salvation come from Yahweh alone. When we want to write off governmental leaders as useless at best or obstructions to God’s purposes at worst, the writer of Psalm 72 gives us words to pray for our leaders so that they might be held accountable to God’s political agenda. Along with thirty-two daily readings and reflections, The Politics of Praise also contains brief essays on Yahweh’s political agenda and how praying these psalms aligns our priorities with God’s. Other essays explain the method of devotional reading I propose and how it differs from other important ways of reading the Bible. Two appendices at the end of the guide describe some of the textual, cultural, and historical details of the psalms, while maintaining a devotional posture toward the Scripture. 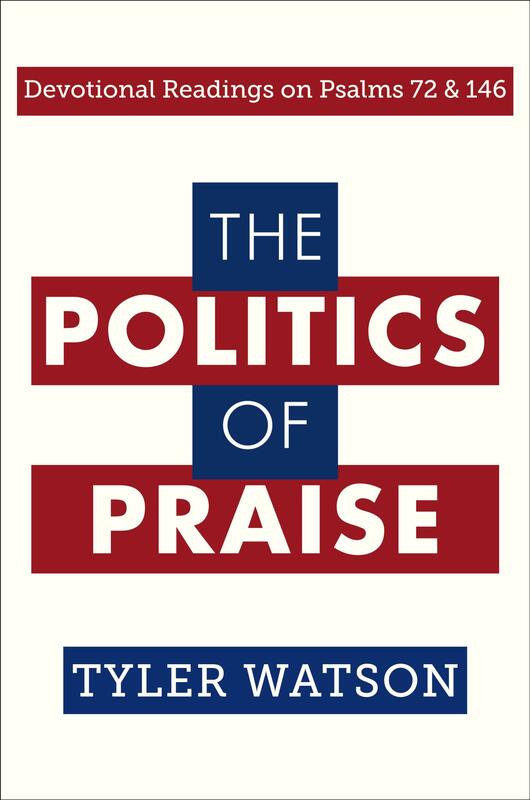 The Politics of Praise is available at Amazon.com for $3.99 on the Kindle format, or $7.99 in paperback. A free preview is available on the Amazon product page. If you don’t have a Kindle, you can still purchase and read the guide electronically by downloading the free reader app that works on smart phones, tablets, PC’s, and Macs. I have written three other self-published devotionals on various psalms: Delivered from All My Fears: Devotional Readings on Psalm 34, My Companions are in Darkness: Devotional Readings on Psalm 88, On the Glorious Splendor: Devotional Readings on Psalm 145. Eddy Ekmekji and I co-wrote an Advent devotional, Embrace the Coming Light. All these books are available for purchase in Kindle or paperback at Amazon.com. Feel free to also visit and “Like” my author pages at Amazon and Facebook. I have co-written a devotional for Advent with my good friend Eddy Ekmekji, Embrace the Coming Light. Advent begins this year on December 1. It is available in the Kindle format from Amazon.com. It will soon—i.e., a couple of days—be available in paperback from Amazon as well as in other eBook formats from those retailers. All the authors’ net proceeds will go to World Vision’s relief efforts for the victims of Typhoon Haiyan in the Philippines. Embrace the Coming Light follows four figures from the Gospel of Matthew’s account of Jesus’ birth: Herod, Joseph, the wise men, and John the Baptist. Readers take a journey that begins in darkness and isolation and ends in light and community. Each week includes a variety of ways to engage Scripture (inductive Bible study, imaginative reading, and lectio divina), a psalm, and writings from other Christians. 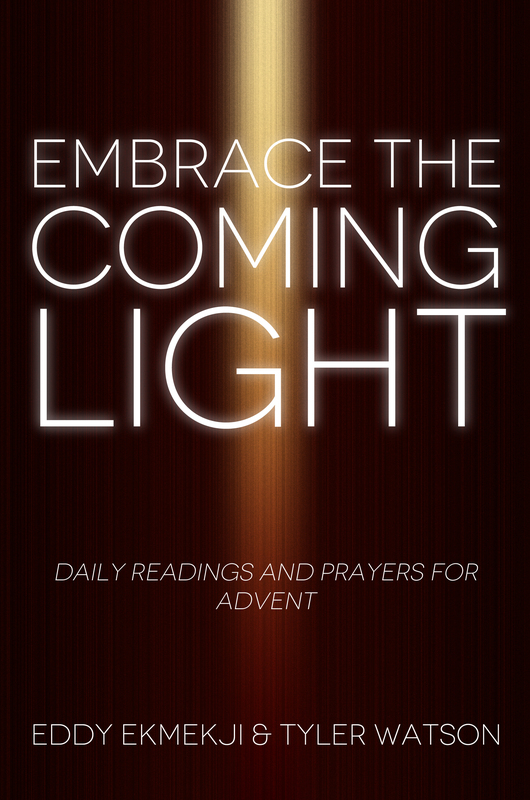 Embrace the Coming Light also guides readers through a weekly spiritual discipline (a social media fast, solitude, generosity, and adoration) to help deepen the experience of Advent. The devotional has 28 days of readings and prayers and can be used with minor adjustments for Advent in any year. I’m very excited about this devotional. It was spiritually rewarding and a lot of fun to write with Eddy. He asks such profound and deep questions. I love his constant emphasis on engaging the whole person through prayer, reading, and spiritual disciplines. And he’s a fantastic writer.